Apparently Canonical decided to tone down its message later in the day—the slogan now reads "Your wish is our command"—but it seems fair to say that the underlying challenge remains. Ubuntu comes with a variety of software packages, including Firefox, Thunderbird, and the full-featured productivity suite LibreOffice. Initial uptake of Windows 8 has been unenthusiastic, according to reports, and a full 80 percent of businesses will never adopt it, Gartner predicts. As a result, Microsoft's big gamble may be desktop Linux's big opportunity. Perhaps the biggest surprise for many users of Windows 8's mobile-style Modern UI is that it has no Start button. Unity, on the other hand, became a default part of Ubuntu back in April 2011 with Ubuntu 11.04 “Natty Narwhal.” It has definitely undergone growing pains, but more than a year has passed, and Canonical has revised the interface accordingly. Although it still has numerous critics, most people concede that it has matured and improved. Some observers, in fact, have even suggested that it may feel more familiar to many longtime Windows users than does Windows 8. One advantage of Ubuntu Linux is that it supports multiple workspaces. Linux has long been known for its virtually limitless customizability, but given the current controversy surrounding desktop interfaces, that feature has become more salient than ever. This is a point on which Windows 8 and Ubuntu differ considerably. Yes, Windows 8 does allow users to customize some aspects of their environment, such as by specifying the size of Live Tile icons, moving commonly used tiles to the left side of the screen, or grouping tiles by program type. Most of the changes you can make in Windows 8, however, are largely cosmetic, and they don't include a built-in way to set the OS to boot to the traditional Windows desktop. A growing assortment of third-party utilities such as Pokki can restore that capability, but otherwise you're stuck with Modern UI. Windows 8 offers what you might call a "tightly coupled" interface—in other words, one that you can't change substantially. Microsoft's Windows Store was sparsely populated at launch, but company executives have said that the number of apps will increase quickly. Also available for Unity are third-party customization tools, including the increasingly popular Ubuntu Tweak, while a raft of “look” sites are available for myriad Linux interfaces with a variety of themes to change the desktop's appearance. Whereas Windows 8 Pro comes bundled with Microsoft's Internet Explorer 10 browser, Ubuntu comes with a wide assortment of open-source software packages such as Firefox, Thunderbird, LibreOffice, and more, offering both individual and business users a pretty full suite of functionality. Similar to Microsoft's SkyDrive, Ubuntu One allows users to back up and access their files from Ubuntu, Windows, the Web, or a mobile device. 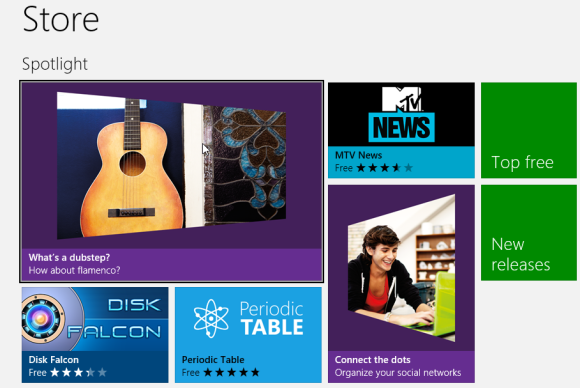 The Windows Store just launched with Windows 8, and at the time of its debut it included just over 9000 apps. Microsoft execs have said that they hope to provide 100,000 apps in the Windows Store within 90 days of the Windows launch. Operating system binaries and drivers, however, will not come from the Windows Store. Rather, it will have both Windows RT (ARM) apps and Windows desktop (“legacy”) apps. Entries for legacy desktop apps in the Windows Store will take users to separate sites where they can purchase or download the apps. Ubuntu’s repository, on the other hand, centrally stores all operating system and app binaries and drivers. As a result, aside from numbers, a key difference between the two app stores involves security. Ubuntu provides a GNU Privacy Guard (GnuPG) keyring-protected repository system wherein each application and driver has a unique keyring identity to verify its authenticity and integrity as having come only from the Ubuntu repo system. The keyring method of protection has been highly effective at ensuring that no rogue applications find their way into the repo—or onto users' PCs. Much like the Windows Store, the Ubuntu Software Center gives users instant desktop access to thousands of applications, many of them free.